This is a FTDI Based USB 2.0 to RS-485 converter module. It supports multi-point communication with each converter able to connect to 32 devices. It provides two way communication moreover you can also use it as USB to TTL converter or TTL to 485 converter as well. It supports USB 2.0 standard and has backward compatibility. It is in line with standard RS485 Direction Control. It supports wide baudrate from 300-9216000 bps. It supports various devices with 485 communication like Programmable Logic Controllers (PLC), fingerprint attendance machines, Surveillance Cameras, PBX, CNC Machines etc. Supports wide baud-rate of 300-9216000 bps. Supports Windows 98, ME, 2000, XP, WIN7, Vista, Windows8, Windows10. No external Power Supply Required. It is Powered via USB Port. Supports Multi-point Communication. Each converter allows upto 32 RS485 devices to be connected. 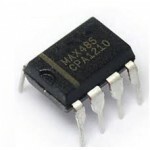 USB to 485 Convertor Based On PL2303Controlling / Communicating with RS-485 devices from your PC has..
MAX485 TTL to RS485 ICThe MAX485 is low-power transceiver for RS-485 and RS-422 communication. Each ..